Herold at the Washington Navy Yard after his arrest, 1865. 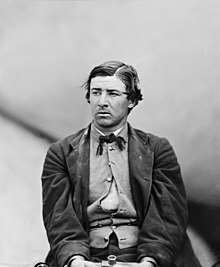 David Edgar Herold (June 16, 1842 – July 7, 1865) was an accomplice of John Wilkes Booth in the assassination of Abraham Lincoln on April 14, 1865. After the shooting, Herold accompanied Booth to the home of Dr. Samuel Mudd, who set Booth’s injured leg. The two men then continued their escape through Maryland and into Virginia, and Herold remained with Booth until the authorities cornered them in a barn. Herold surrendered, but Booth was shot and died a few hours later. Herold was sentenced to death and hanged with three other conspirators at the Washington Arsenal, now known as Fort Lesley J. McNair. David E. Herold was born in Maryland, the sixth of 11 children of Adam George Herold (June 6, 1803 – October 6, 1864) and Mary Ann Porter (January 8, 1810 – February 16, 1883). Adam and Mary were married on November 9, 1828 in Washington, DC. David was their only son to survive to adulthood. His father Adam was the Chief Clerk of the Naval Storehouse at the Washington Navy Yard for over 20 years. Herold's family was well-off financially and lived in a large brick house at 636 Eighth Street SE in Washington, D.C., near the Washington Navy Yard. David attended Gonzaga College High School, Georgetown College, Charlotte Hall Military Academy (at Charlotte Hall, St. Mary's County, Maryland), and the Rittenhouse Academy. In 1860 Herold received a certificate in pharmacy from Georgetown College. He then worked as a pharmacist's assistant and as a clerk for a doctor, and was an avid hunter. He became acquainted with John Surratt while attending classes at Charlotte Hall Military Academy in the late 1850s. A few years later, in December 1864, Surratt introduced him to John Wilkes Booth. The unmarked grave of David Herold in the Congressional Cemetery. Herold and a group of co-conspirators had originally plotted to kidnap Lincoln, but later decided to kill him, the Vice President Andrew Johnson, and Secretary of State William H. Seward in a bid to help the Confederacy's cause. Execution of Mary Surratt, Lewis Powell, David Herold, and George Atzerodt on July 7, 1865 at Fort McNair in Washington, D.C. Digitally restored. On the night of April 14, 1865, Herold guided Lewis Powell to Seward’s house. Inside, Powell attempted to kill Seward, severely wounding him and other members of his household. The ensuing commotion frightened Herold and he rode off, leaving Powell to fend for himself. He then met with Booth outside of Washington, D.C., and they proceeded to Surrattsville, Maryland (now Clinton, Maryland) where they picked up weapons that Mary Surratt had left earlier for them at her property. Another conspirator, George Atzerodt, was supposed to kill Vice President Andrew Johnson, but never made the attempt. It was at this point that John Wilkes Booth shot Lincoln at Ford's Theater. When Booth jumped onto the stage of Ford's theater, he broke his fibula. When Booth went across the bridge into Maryland, he met Herold there. They retrieved their weapons cache and proceeded to the home of Dr. Samuel Mudd, who set Booth's leg. Herold remained with Booth and continually aided him until Union cavalry caught up with them. Herold and Booth were trapped by authorities on April 26, 1865, after taking refuge in a barn on the property of Richard Henry Garrett. Herold surrendered, but Booth refused to lay down his arms and was shot by Sergeant Boston Corbett through a crack in the barn wall. He died a few hours later. Herold was tried before a military tribunal. As he had already admitted his involvement in the assassination conspiracy, the only defense his lawyer Frederick Stone could offer was that David was feeble-minded and under undue influence from Booth. His defense being unsuccessful, Herold was convicted and sentenced to death. He was hanged in Washington City on July 7, 1865. The fall from the gallows did not break his neck; he struggled for nearly five minutes, slowly strangling to death. On February 15, 1869, David's mother and five of his sisters interred his remains in Congressional Cemetery (Washington, DC) in an unmarked grave, next to the grave of his father Adam. 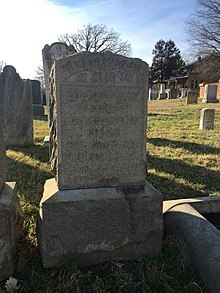 The gravestone memorializing David now present in Congressional Cemetery was placed there in July 1917, at the time of the burial of his sister Mary Alice (Herold) Nelson (October 16, 1837 – July 1, 1917) in the cemetery. Mary Alice was the wife of Frederick Massena Nelson (January 1827 – May 11, 1909) of Pomonkey, Charles County, Maryland. Gore Vidal's fictionalized account of Lincoln's presidency, Lincoln, includes a heavy focus on David Herold. In the Afterword, where Vidal explains the extent to which his novel is true to fact, he writes, "As David's life is largely unknown until Booth's conspiracy, I have invented a low-life for him." In the Stephen Sondheim musical Assassins, David Herold appears in the song "The Ballad of Booth", where Booth forces Herold at gunpoint to write why Booth killed Lincoln. However, when soldiers surround the barn where they hide, Herold runs. ^ "Herold, Adam G." Historic Congressional Cemetery. Archived from the original on February 1, 2014. Retrieved January 23, 2014. ^ "Obituary - Herold, Adam G." Historic Congressional Cemetery. December 28, 2009. Archived from the original on July 25, 2011. Retrieved July 7, 2011. ^ "Herold, Mary Ann". Historic Congressional Cemetery. Archived from the original on July 25, 2011. Retrieved July 7, 2011. ^ "Obituary - Herold, Mary Porter". Historic Congressional Cemetery. December 28, 2009. Archived from the original on July 25, 2011. Retrieved July 7, 2011. ^ Griffin, John Chandler (2006). Abraham Lincoln's Execution. Pelican Publishing. p. 163. ISBN 9781455600106. Retrieved May 29, 2018. ^ "Herold, David Edgar". Historic Congressional Cemetery. Archived from the original on July 25, 2011. Retrieved July 7, 2011. ^ "Obituary - Herold, David". Historic Congressional Cemetery. December 28, 2009. Archived from the original on July 25, 2011. Retrieved July 7, 2011.